Powers/Abilities:In what appeared to closest to his true form, the Dark Overlord was an enormous creature, and as such, possessed strength in relation. He possessed certain shape shifting abilities as well. Other abilities include telekinesis and pyrokinesis. He had some sort of eye beam that could immobilize and dematerialize living beings. He required feeding on energy to survive, from a car battery to a nuclear reactor. History: (Marvel Super Special#41 [BTS] - After losing the First Cosmic War eons ago to an unknown enemy, the Dark Overlords were exiled to the Nexus of Sominus, a region of demons. (Marvel Super Special#41 (fb)/[BTS]) - While attempting to rework his Laser Spectroscope to send Howard the Duck back to his homeworld, Dr. Walter Jenning accidentally brought one of the Dark Overlords to earth by mistake. The creature took refuge in Jenning's body. (Marvel Super Special#41) - Jenning, hurt by the explosion caused by his machine, was helped away by Howard and Beverly Switzler. As time went on, the Dark Overlord began to take over Jenning's body and personality. While at a truck stop, the demon came into full control of his host, and explained his origins to two. When locals attacked Howard, the Dark Overlord attacked them and left with Beverly. He then stole a diesel truck and headed back to the laboratory. On his way, he broke into the Cuyahoga Nuclear Power Plant, draining it of power, and then killed a large amount of people at a police roadblock. Once there, he strapped Beverly to a table, intending to use the Laser Spectroscope to bring down another of his race and put it in her body. Howard, along with lab assistant Phil Blumburtt, broke into the lab and made their way to an experimental weapon called the Neutron Disintegrator, which they intended to use against the creature. They confronted the Dark Overlord and blasted him with the weapon, driving him out of Jenning's body. 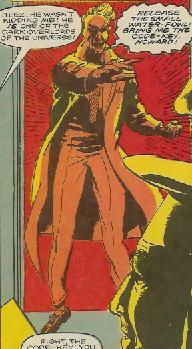 He emerged as a giant creature, and began to assume the duck-like form of Howard, while starting up the Spectroscope. Howard blasted it again with the Disintegrator, killing it. However, the rest of the Dark Overlords were being brought down to earth, and with no choice, Howard destroyed the machine, and his only way home, to stop them, sending them back to the Nexus of Sominus. Comments: Created by Willard Huyck, Gloria Katz and Phil Tippett. Adapted as a comic character by Danny Fingeroth and Kyle Baker. As is obvious, this story is the adaptation of the 1986 movie Howard The Duck. As the Dark Overlord and his kin have no correlating counterpart in the Earth-616 version of Howard's adventures, I felt he'd fit right in here. However, I would like to point out the difference between this one, which I've dubbed Earth-58472 (Howard Movie Adaptation), would be different from Earth-Howard Movie, as there are some differences between the two (the Dark Overlord's final form being the main one). It is very possible that the Nexus of Sominus (or at least another version of it) can be accessed in the Earth-616 reality, but until that's proven (as in, never), it will remain as a dimension within that particular alternate reality. Thus the �extra-dimensional, extra-temporal� designation. Even this is not totally correct, as the Overlords were originally from the dimension Earth-58472 (Howard Movie Adaptation) is in, but were exiled to the Nexus. 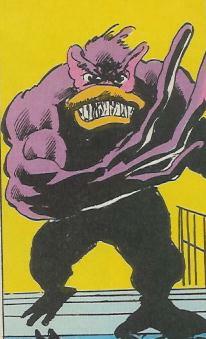 In the comic version, the Dark Overlord, once purged from Jenning's body, begins to take on the form of an anthropomorphic duck. In the actual movie, he did no such thing, instead revealing his true self, a giant-mawed, scorpion-like creature. 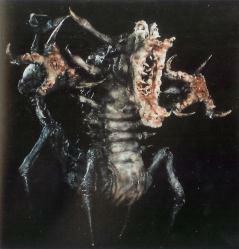 Here is a picture of that version, as created for the movie by special effects man Phil Tippett. 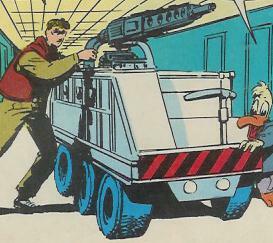 One month after the release of this graphic novel, it was split into three issues and released monthly as Howard The Duck: The Movie in a more conventional comic format. 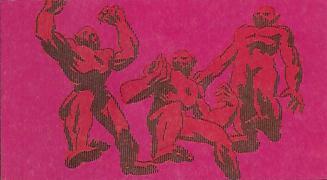 A race of beings/demons that were exiled to the Nexus of Sominus by unknown adversaries after the First Cosmic War. One was pulled from the Nexus by Dr. Jenning's Laser Spectroscope and attempted to bring the rest to Earth. They sought the annihilation of all other life. Dr. Walter Jenning created the Laser Spectroscope that brought Howard and a Dark Overlord to Earth, the Dark Overlord possessing his body. 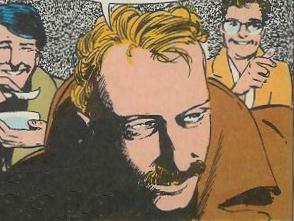 Howard and his allies purged Jenning's body of the demon. Phil Blumburtt was an assistant of Jenning's with dreams of becoming a world-renowned scientist. He helped Howard defeat the Dark Overlord and rescue Beverly. Afterwards, he became a technician for Beverly's rock band, the Cherry Bombs. The Laser Spectroscope was a machine designed for long distance space discovery, such as measuring the density of gases on other planets. After it lost control the first time, it pulled Howard from his world to Earth-58472 (Howard Movie Adaptation). When it was being prepared to send Howard back, it went haywire again, this time pulling a Dark Overlord to earth. When that Dark Overlord attempted to use it to bring his brethren to Earth, Howard destroyed it with the Neutron Disentegrator. 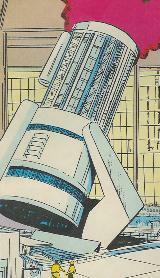 The Neutron Disentegrator was a weapon designed by the government that was used by Howard and Phil to purge Jenning of the Dark Overlord and destroy the Laser Spectroscope.